For scalp discomfort, a medley of tea tree essential oil, quinoa protein, calendula and aloe work together to nourish hair, balance moisture levels and soothe irritation. The result: strong, shiny hair and lasting scalp comfort. Aloe Barbadensis Leaf Juice(1), Aqua (Water), Glyceryl Stearate SE, Caprylic/Capric Triglyceride, Helianthus Annuus (Sunflower) Seed Oil(1), Cetyl Alcohol, Stearic Acid, Stearyl Alcohol, Olea Europaea (Olive) Fruit Oil(1), Butyrospermum Parkii (Shea) Butter(1), Citrus Aurantium Dulcis (Orange) Peel Oil, Eucalyptus Globulus Leaf Oil, Melaleuca Alternifolia (Tea Tree) Leaf Oil, Mentha Arvensis Leaf Oil, Mentha Piperita (Peppermint) Oil, Rosmarinus Officinalis (Rosemary) Leaf Oil, Simmondsia Chinensis (Jojoba) Seed Oil(1), Calendula Officinalis Flower Extract(1), Chamomilla Recutita (Matricaria) Flower Extract(1), Chenopodium Quinoa Seed(1), Tocopheryl Acetate, Sorbitol, Alcohol(1), Benzyl Alcohol, Potassium Sorbate, Sodium Benzoate, Limonene, Linalool. 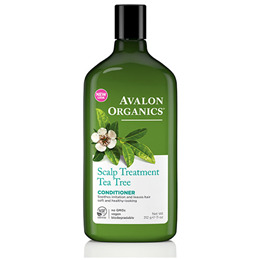 Below are reviews of Avalon Scalp Treatment Tea Tree Conditioner - 312g by bodykind customers. If you have tried this product we'd love to hear what you think so please leave a review. Prompt delivery, well-packaged with biodegradable material. Product really kind to my scalp.